The Shigeru Kawai SK-EXL is Kawai’s world-class concert grand, receiving praise from a wide range of pianists across the world. 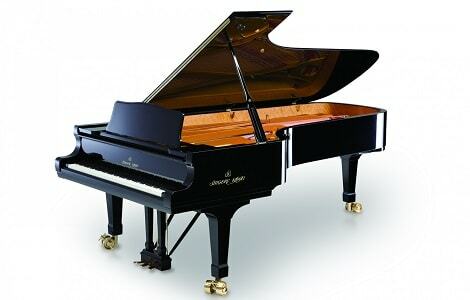 You may not be able to house such a piano, but it demonstrates the expertise that influences every Kawai piano. Like all pianos bearing the Shigeru Kawai name, the SK-EXL is hand crafted in very limited quantities by master piano artisans, with meticulous attention paid to extracting the musical soul from the very finest materials. SK-EXL has the power and projection to communicate the passion of a concerto soloist with full orchestra. The precise and responsive action also enables finely graded control at the quietest dynamic levels in more intimate solo recital, chamber music and duo repertoire. It combines a warmth and depth of sound with a level of clarity that heightens opportunities for exploring harmonic colour. The carefully crafted soundboard and structured hammerfelts enable it to project into the largest of concert halls and communicate the full range of expression without losing the core quality of the sound. The SK-EXL has become the first choice of Mikhail Pletnev, who praises the flexibility which the instrument offers him. At the Ninth International Hamamatsu Piano Competition, the SK-EXL was a popular choice. Those who selected it for their performances included First Prize winner Alexander Gadjiev, and fourth prize and Chamber Music Award winner Florian Mitrea. The SK-EXL has also been praised by ECHO artist Ashley Fripp, concert pianist and teacher Julian Saphir, and the 2010 BBC Young Musician Lara Melda, among others.